Our intermediate program builds on the foundation laid in the primary grades and helps students transition from teacher-directed learning to self-directed learning. Third grade is a huge transition time for elementary aged children. In third grade, children’s view of the world changes. They realize the world is bigger and more exciting than going to Grandma’s house or visiting the zoo. In third grade, students transition from learning to read to reading to learn. This is often the time that “makes or breaks” pleasure reading for children, and the time many children discover subject favorites. In fourth and fifth grades, students develop their own “style” of learning. Some enjoy group work at this age; others prefer to work alone. Some thrive in energetic learning environments; others need quiet. At Wapiti, we provide the space and time for students to explore each of these learning methods and find the one that works for them. Field trips are learning opportunities outside the classroom. They are a fun balance to our curriculum, and we look forward to providing them. These interactive, hands-on experiences boost learning and show students the “real-world” applications of what they are learning. Parent support is essential for these learning experiences to work. Please consider joining us as a chaperone. Students set up personal accounts on our school network they can use to send/receive emails with other Park County students and teachers. Both classroom teachers and parents can access and monitor their student’s email account. Students use documents (including word processors, spreadsheets, forms, and presentations) to create reports and presentations for sharing and collaboration. 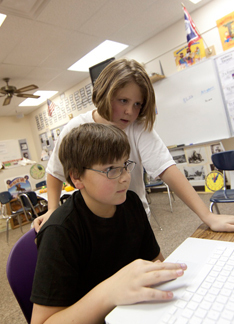 Some of our required state and district assessments have moved to web-based applications. Students have access to a variety of education apps and games they can use on our classroom iPads during free time. However, they cannot install applications on these devices.